Whether you call it Dilaps or Dilapidations or whether you are a landlord or a tenant Dilapidations is not generally considered to be a good experience. We are experienced Dilapidations Surveyors and can help you whether you are a landlord wishing to serve a Dilapidations Notice on a tenant or a tenant defending a Dilapidations served by a landlord we are happy to represent you. If you are just about to take a Lease and are reading this article then we urge you to have a Schedule of Condition carried out as this identifies existing problems in the property and also clarifies future liabilities. It is best to discuss all of these property matters before the Lease is signed. 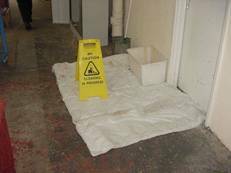 Please do not hesitate to call us on free phone 0800 298 5424 to discuss Dilapidations further. A Dilapidations claim by the landlord is as certain as death and taxes although it often comes as a shock due to the tenants or lessee due to the amount of money that the claim is for and costs. Remember the rules (covenants) within the lease make you legally liable to carry out the various requirements and as such it is a semi legal process that you will be involved with if you negotiate with regard to the Dilapidations claim. 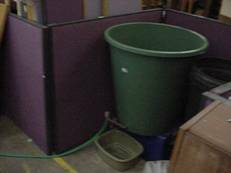 A Dilapidations Notice is required whereby the property is to be given back in the standard set out within the Lease. Most Leases are Full Repairing and Insuring (FRI) Leases which means Full. 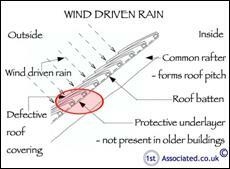 In addition to this there may be other clauses in the Lease such as Good Repairing Standard etc, etc. 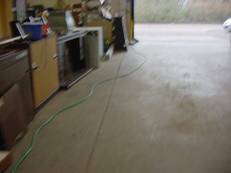 Have a look around our website 1stAssociated.co.uk to check out the quality of our website and Schedules of Condition and Dilapidation reports. We pride ourselves on our professional standard and easy to read reports which we have been carrying out for many years on every age, type and style of property across the UK. 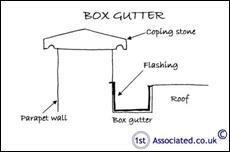 An interesting point that came out of our Dilapidations discussion with one of our clients is that the landlord although they accepted responsibility for the roof that they had carried out the replacement of and although they agreed they had not carried out repairs to the box gutters properly because they had not used a lead flashing but Flashband (which is generally considered a temporary material) the landlord was arguing that they did not have to accept the damage being caused by their own poor repair as the tenant had a duty to report the problem to them. As the landlord did not occupy the property and indeed had to give quiet enjoyment of the property they had no onus to come and view the property. The onus was on the tenant to advise the landlord of any problems. This may seem a strange term but it really means that the landlord has to leave the tenant to carry out their business provided it is within the terms of the Lease. 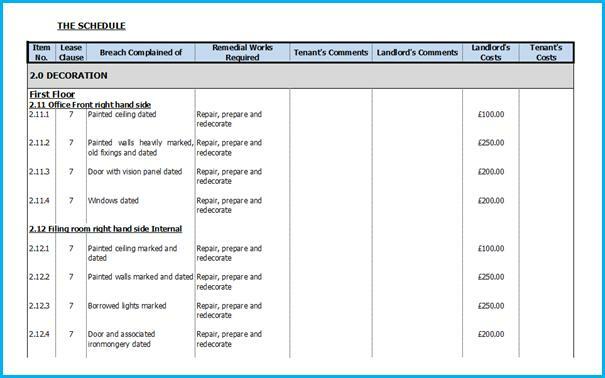 Interestingly whilst our client and tenant advised the landlord's Surveyor that they had verbally informed the landlord and nothing had happened which in their experience had been generally what would happen. 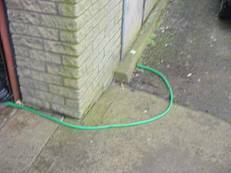 The landlord's Surveyor thought that the tenant should have made this comment in writing and they had not it was the tenant's responsibility. Even though our client and tenant advised the general procedure was a verbal process and that sometimes the Surveyor would appear and visit the property although most of the time nothing ever happened they should have been more persistent and followed up in writing. 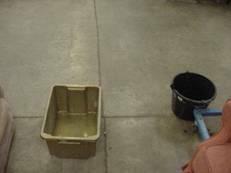 Interestingly the landlord's Surveyor used the argument that the landlord was now carrying out work although it had taken eight months! Interestingly the landlord's Surveyor advised as an example of how ‘quickly' the landlord would react that since he had carried out his Schedules of Dilapidations the landlord was now starting to replace the Flashband (although he was not sure how) only some six months later! which is a long time to deal with a leak. 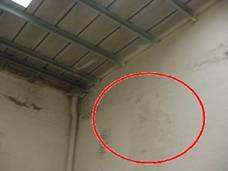 The Dilapidations Protocol was brought up as the tenant's Surveyors had not responded to the Dilapidations claim. This we advised is due to what we thought was a fundamental error in the document and the wish for us to have this reviewed by the Surveyor and confirmation that they were happy with the Schedule of Dilapidations before we started to look at this claim. We advised the landlord's Surveyor that The Dilapidations Protocol is Guidance Notes and where there are issues such as a misunderstanding with regard to a major item such as in this case then these are mitigating circumstances in our opinion. Remember this is a landlord making a claim against our client who are a registered Charity with the Charity having to pay out for the Dilapidations claim. Beware of offers of Leasehold property which are too good to be true as there is often a sting in the tail where you may end up with a Dilapidations claim. You may save hundreds or a few thousands or even tens of thousands of pounds on the rent but this is of no consequence when you have a Dilapidations claim in the tens of thousands to hundreds of thousands of pounds. If you are at the end of a lease whether you are a landlord or a tenant and are looking to deal with the end of the lease with Dilapidations please phone us on free phone 0800 298 5424 and we will provide advice on Dilapidations. Do make sure you talk to a Dilapidations Surveyor who understands your type of property. 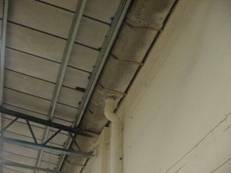 We believe that there is a difference between Surveyors that can deal with Dilapidations on warehouses/industrial buildings or retail or offices. What do the circles and ovals mean in our Schedules of Condition? In our Schedules of Condition the circles and ovals are a system that we used to highlight property problem areas so that you are not left wondering what the property problem is. 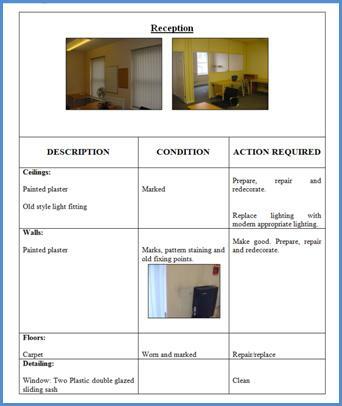 In addition to this if the Schedule of Condition photographs do not we believe explain the property problem enough together with our description we also add in one of our own survey sketches. Please contact our office; we may be able to give you examples of Dilapidations cases that we have dealt with similar to yours and help you understand how to deal with your particular issue. 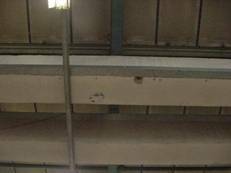 We would be the first to admit that Dilapidations reports are not the most interesting to read but they do cost you a lot of money one way or another are are well worth doing them properly.